The summer weather is here at last, and many cyclists are looking forward to another season of sunshine, long rides over paths and trails, easier commutes to work, or just the simple freedom of heading out on the road. While it’s certainly tempting to bring your furry friends along for the ride, it isn’t without its share of risks. 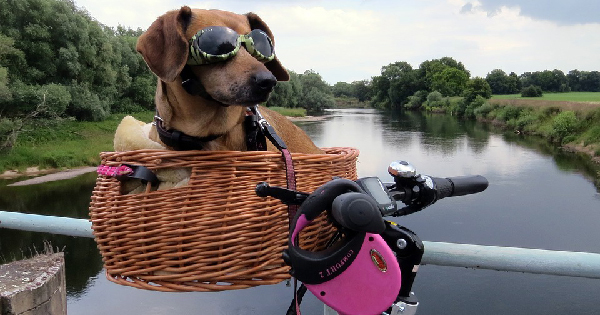 As activists for bicycle safety in all spheres, Bay Area Bicycle Law has put together this list of excellent safety tips for biking with your dog this summer to keep you and your canine companion safe and happy. The first tip begins with the simple fact that biking won’t be a healthy activity for every dog. Smaller dogs won’t be able to comfortably match the pace, older dogs or dogs with a heavier build might not have the stamina for a long ride, and certain breeds are ill suited to distance running in general, no matter how healthy they are. While you should always check with a vet for a professional opinion when considering cycling with a dog, these figures should give you a rough idea of what you can expect. Only medium to large dogs should be taken cycling (weighing more than about 25lbs), but that also depends on the breed. A 10lb pomeranian shouldn’t be compared to a 50lb husky. Dogs with slighter builds, for their breeds, will tend to do better. Dogs with especially long bodies or short legs probably aren’t designed for distance running, and dogs with flatter faces, like bulldogs or pugs, will have a very hard time breathing and will quickly tire out and overheat. Again, these aren’t hard and fast rules, so absolutely do check with your vet to talk about your particular pooch. When joining you for your ride, your dog is pushing much harder than you are. Running hard, so close to the hot, sun-baked ground, with all that fur, is thirsty work, so bring twice as much water as you expect you’ll need, and have a plan to get more if you should run out. Bring a collapsible bowl, and take plenty of water-breaks. Unless you’ve made a habit of training for distance running in other ways, your dog will likely need a few weeks of practice, at least, before being comfortable joining you for a full ride. You should work with your vet to tailor and develop a training regimen, but at the very least, you should begin with short, slower rides, even just around the block, to get your dog used to the experience of running alongside a bike before starting into endurance training. Take these shorter rides multiple times a day for a couple of weeks to gauge how your dog will respond as you increase the pressure. Raise the difficulty every couple of weeks for a more athletic dog, or every six weeks for a less athletic one. Again, these are rough guidelines, and you should definitely consult with a vet before making a concrete plan. Your dog wants to please you. In effect, you’ll be setting the pace for the pack, in an instinctive sort of way, so be sure you’re taking your dog’s needs into account. Your dog is likely to push through to exhaustion if you’re not careful to restrict the ride to an appropriate level. Just stay alert, be mindful, and don’t take your assumptions for granted. Not all huskies will enjoy a long run, for example, and not all dogs who are running are comfortable. It takes a long while for some dogs to build up the callouses on their paws to comfortably run outdoors, and running in urban environments is especially difficult. Road salt is especially harmful, but don’t discount the hardness and corrosiveness of concrete, the grit and glass particulate on most roads and sidewalks, and the unexpected pitfalls of cracks and uneven ground. Paw-protecting slippers are one option, and there are several substances you can use to help protect your dog’s pads, but no matter what other steps you’re taking you should always closely monitor your dog’s paws for cracks, abrasions, hot spots, and other signs of excessive wear or strain. The risks of exhaustion and overheating are running themes in this list. Take rides in the cooler parts of the day, and stay out of midday sunlight as much as possible. Plan routes for shade, and take plenty of rest stops as needed. Watch your dog for signs of heat exhaustion particularly during these breaks. If your dog is panting for more than five or ten minutes, or if your dog lies down immediately after a cycling session, you’ve likely been pushing too hard. Now that all the hard parts are taken care of, it’s time to have some fun! You’ll likely need a whole new set of training commands, even if you’re planning to bike the same route regularly. Dogs, unlike humans, lack polysemy. Basically, they have difficulty extrapolating a concept from one context to another, or applying multiple meanings to the same root concept. Just because your dog can fetch a ball doesn’t mean she will fetch a stick. When you’re biking, you’ll want to have developed terms for Slow Down, Prepare to Turn Right, Prepare to Turn Left, Prepare to Stop, Advance Slow, and Form In. These are obviously going to have a slightly different flavor from your standard walking commands, so be sure you choose words and phrases that are easily distinguished, even at pace. You want to be able to communicate with your companion without ambiguity. We hope that, with these tips, you and your canine companions will be ready for a long and rewarding cycling summer.